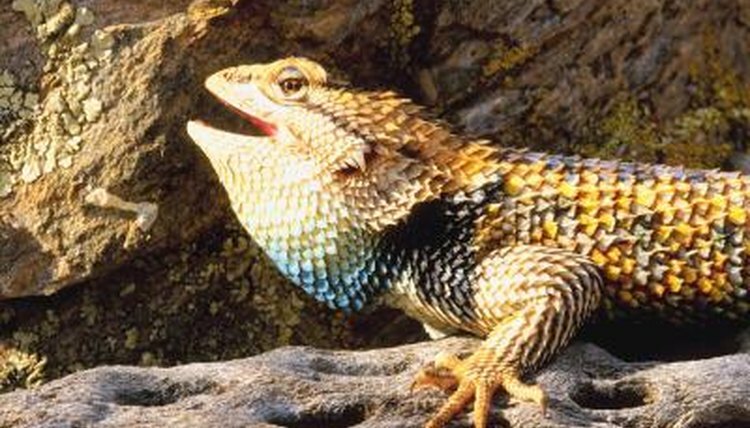 Desert spiny lizards, found in nature throughout the Southwest, have unique scale coloring, including purples, blues, oranges, reds and yellows along their bellies, backs and throats. Desert spiny lizards, active from March to October, are omnivores. Desert spiny lizards hunt for prey such as ants, beetles, spiders, centipedes, other small lizards and nestling birds. To hunt, desert spiny lizards depend on their sharp vision to watch for movement of insects and small lizards. Desert spiny lizards crush their prey using small teeth -- they have teeth on the roofs of their mouths as well as along their upper and lower jaws. Desert spiny lizards live in habitats such as desert scrub, woodlands and interior chaparral. When not hunting for animal prey, these lizards also actively forage for vegetation. Desert spiny lizard eat plant matter such as flowers, leaves and berries.